Warning! This is a very long document. I recommend saving with images and viewing it at your leisure offline. If you are using an older browser, you may be missing something. The Need For Speed series is without doubt, the best simulated racing experience ever! The third installment introduces the Hot Pursuit mode, where you get to run from the law or play a cop and bust the law breakers. The game perfectly balances the pure adrenaline fuelled fun of high speed with the technical challenge of serious racing in one dangerously habit forming package. Be warned that there are no rehab clinics for this addiction. If you can't get enough of this great game, you will definitely want to make use of these cheats.Type the following codes in the main menu, and then click on 'Race'. bullhorn Cops hail you as they pull you over. Not very impressive. dcop Get behind the wheel of the Pursuit Diablo. The best of the pursuit vehicles. Become 'Top Cop' on all tracks including Empire City to unlock this car. ecop Brings the awesome El Niño to the side of the law in the form of the Pursuit El Niño. Turns sports cars into wrecks. Become 'Most Wanted' on all tracks including Empire City to unlock this car. elnino Kick up a storm with the El Niño. Lots of Speed, very little Control, great Fun! gofast Makes your car go as fast as its RPM limit will allow, in Single Race mode. Be warned that it is only your speed that increases, braking and handling remain the same. This cheat only works if tuning is at default settings. I get the best results with the Corvette and the Diablo. jag Unleash the Jaguar XJR-15. Quick, non-linear steering makes this the most difficult car in the garage, but helps you get away from the cops. Play and Win Beginner Tournament to unlock this car. madland Opponent AI is unshackled. The whole gang drive as fast as they can go at speeds that seem unlikely with factory settings. merc Rule the road with the Mercedes CLK GTR. Play and Win Expert Tournament to unlock this car. monkey Gives you performance shifting on automatic transmission, resulting in a significant increase in speed with a slight loss in handling. rushhour Increases the traffic on the road. Your cars gonna be wrecked. This cheat increases the traffic very slightly in Hot Pursuit mode. The moment you hear the announcer say 'GO', press the 'Reset' button (default 'R') and your car will teleport in front of the car ahead of you. Press it repeatedly to leap frog several cars at the start of the race. Of course, your opponents are accelerating while you do this, so you may soon lose whatever you've gained. A lot of Trial and Error (mostly error) is required to find the number of jumps that give you an advantage. Can't Stop This Thing We Started! Bored driving the same old super exotic sports car which you can only dream of? Type in these cheats and click on 'Race' in Single Race mode to burn rubber with these real world cars. 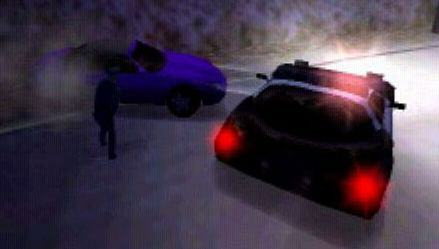 This screen grab from the demo shows the Pursuit Corvette enforcing the law. Are cops getting the better of you with spike strips? Having trouble stopping the Scofflaws even with a Pursuit Diablo? Use these hints to become the absolute Hot Pursuit Champion. There are a number of shortcuts in the tracks that you can use to dodge the cops, as they loose sight of you when you dive into these paths, unless they are right on your tail. Be warned that these shortcuts are not easy to negotiate, and will slow you down. Empire City has number of alternate paths which can help you out. The easiest comes soon after the beginning of the track,and is nothing more than a gap on the left, similar to the one at the Redrock Hairpin. I recommend making use of it at the end of the race when racing Backwards. Immediately across the road is a fenced off bypass, which requires careful driving. My advise is to ignore this one. An elevated path will appear on the right through the boards, a little after the Old Town Elevation. Also check out the elevated path on the right before the Cathedral which can help you out in a tight situation. Country Woods offers a very handy off road path on the right, soon after the Old Tunnel. You have to make your way between the trees and avoid the fences, which is not easy, as the deep snow has you floundering. However, you don't have to negotiate the entire shortcut. Go a little away between the trees and hit the Reset button (default 'R'). Your car will teleport to the other side of the track (of course this isn't sporting, but you're the one looking for cheats). Be warned that you will be busted very easily if you find a cop on the other side. Redrock Ridge has a gap just before the Redrock hairpin. This one is very easy, and gives you an advantage in any racing mode. Take extra care if attempting with an El Niño. Aquatica has an elevated path along the left hand side of the Seaside Tunnel, similar to the one in Empire City. Look on the right for a very narrow path near the Citadel. Atlantica has a path connecting the Boardwalk with the Sky Bridges. The boardwalk end is open in Aquatica but the other end is sealed. Drive onto the planks of the Boardwalk to avoid cops and traffic. This can also shave seconds off your lap time as you don't have to brake hard to get onto the concrete path. It also give you a good slingshot as you come off the boardwalk, which makes for great overtaking. Lost Canyon has a path running right through the Ruins, (where the fires are) but it has to be taken slowly to avoid crashing. This actually slows you down a lot, but is useful to shake off pursuit. Your supercar should be more than capable of leaving the patrol vehicles far behind, right? Wrong! Slower vehicles don't have to slow down much to negotiate turns, and will gain on you. Even (especially ?) the El Niño will not help you much unless you plan on ramming your way through. The Scighera is one of the best cars to use to run from the law as it's combination of speed, acceleration, braking and handling will have you sliding through turns and weaving through traffic on your way to being Most Wanted. If the cops are catching up on ya, you can escape by braking hard and letting them shoot past you. Scraping your car against the wall and using the Hand brake help retardation. If you need to avoid several cops, after you slow down, take a U-turn, continue for a short distance, then flip a quick U-turn and continue with the race. The patrol vehicles cannot anticipate your U-turns and will take longer to recover from these quick turns, giving you some breathing space. However, this will cost you time against your opponent. Sometimes its better to let yourself be ticketed, rather than waste time dodging. Use your judgment. What do you do when a Spike Strip plus Roadblock totally block your path? Go as close as possible and flip a quick U-turn. The spike strip will disappear and the cops break up the roadblock to come after you. The track is now clear. When you're playing the cop, keep Teleport turned on. When you teleport after a bust, drop the spike strip on one half of the road and use the hand brake to slide-turn and block the other. Whichever car hits the spike strip will be automatically targeted if you are in range, and you can bust him. Even if you are out of range, the spike strip will slow 'em down. Driving on a narrow road helps. If you are about to run into the back of a cop, lift off the gas. You are more likely to bounce off the vehicle, increasing your chances of getting away. When you're playing the cop, use the same trick against speeders to knock them onto the side of the road. Want to improve your stopping skills? Learn from the cops while you're running from them! Observe their law enforcement techniques (such as the way they bump into the corner of your car before overtaking)and use them to achieve the Met Quota in record time and become the ultimate Top Cop. Even Moses didn't have it this easy through the Red Sea. Use arrow keys for turning left/right and shifting up/down if you choose manual transmission. Playing with manual transmission on a keyboard is very difficult, since there is no feedback to tell you which gear you are in and which gear you have shifted to. Finding Reverse is particularly difficult. Getting Neutral is so easy, it challenges the laws of probability. I only keep these two cameras on, as I need to quickly switch between them, particularly in Hot Pursuit mode. Bumper Cam - Gives you a very good feel of your cars speed, and aids tight cornering. Just what the Road Hog ordered for bumping speeders (and opponents) into obstacles. Heli Cam - This third person view shows you where you are in relation to the vehicles around you, enabling you to choose the right line to accurately slam/avoid slamming into them. Also useful when trying to find the right approach to steeply banked turns. In Car Cam gives you a better view along the side of your car which can help you when overtaking. However, this view significantly slows down my computer (Pentium 233 MMX, 64MB Ram, DirectX 8), so I don't make use of it. Be aware that Assists are not available in Knockout and Tournament, so you will definitely want to learn to play without them. However, they can be very useful if you are new to the game and have difficulty controlling your car. Navigator Kiddie Stuff. Doesn't do anything much other than slow down your computer. Collision Control Cuts down recovery time after a collision. This may not help you much in Single Race as you may be left far behind even with quick recovery, unless of course, you are way ahead. However, this can be useful in Hot Pursuit as you can be busted in the time it takes you to recover and shaving a couple of seconds off this time may give you a chance to get away. Unfortunately, collision control still leaves you with the job of finding a way around the obstacle after you recover. I prefer to use the Reset button as you will usually teleport onto a clear section of the track, though even this won't be of help if a cop is really close. To get quick recovery times with Collision Control turned off, lift off the gas just before you hit an obstacle. Even a slight reduction in speed gives significant improvement in recovery time. Braking Slows your car down as you approach a turn. Braking starts well in advance of a turn, so you will want to turn this off once you get the feel of your car and start experimenting sliding into a turn. This assist will particularly hold you back in Country Woods. Traction This is the most important assist, a Torque Regulator which keeps your wheels from spinning and helps your car maintain a line. Turning this off will help whip your tail through a turn, but you will lose handling on the straights. Why do you need handling on the straights? Because there are no true straights in this game. You can find a fairly straight line by weaving your car through a path, but run the risk of scraping your side if your car pulls too much. Best Line Orange cones appear on the track, showing you the best line, and an on-screen display tells you the number of cones you hit and a percentage count helps you evaluate your performance for the entire track. However, the best line should be taken only as a suggestion and not as a rule since it will vary depending upon the car you are driving, tuning, weather, traffic and driving style. Driving strategy should also be considered as you may choose a different line to pull ahead of an opponent or to cut him off. Additionally, it doesn't make sense to stick to the best line when the cars in front of you are kicking up dust, increasing the chance of you running into an obstacle as the visibility decreases. You will be better of choosing a path that is free. This tactic is particularly useful along the Divided Highway. If you are always losing ground on a certain section of a track, you could use this assist to see where you're going wrong. Knockout and Tournament don't allow you to tune your car. This aside, tuning helps you understand your car as you may expose its strong and weak points. If you have the hunger to set lap and track records, you will find yourself here with your head under the hood, tweaking the settings to get that fraction of a second advantage. A little technical knowledge wouldn't hurt. Don't judge your car's performance by top speed alone. It's the track and lap times that count. & Gear Ratios If you have read the tips provided by EA, you would understand that a tight, twisty circuit needs bottom end tuning and high gear ratios, right? Wrong! High gear ratios would mean your engine spends most of the time in the higher regions of the rev range and would therefore require top end power (or a punchy midrange). When tuning for faster tracks, remember that lower gear ratios need a generous dose of midrange power to give your car competetive acceleration. If you absolutely need to have top end power, try cutting down on downforce if you are confident of your driving skills. Brake Balance This setting depends a lot on driving style and suspension setting. Tuning to the front will help swing your car through tight turns but straight line retardation won't be, well, straight line. Suspension A stiffer suspension setting will fight the road i.e. your car will swing out as you frantically steer in, but will maintain a predictable line allowing you to build up speed on wide straight stretches. Softer shocks will help your car hug a tight turn, but cause drifting on sweeping curves. Additionally, you may hit the inside of the turn since the car tends to 'toe-in' while turning. Steering Speed Quicker Steering needs a delicate touch and fine control, both of which are quite difficult to achieve on a keyboard. However, it can be used to compensate for stiff shocks, so try out various settings until you find one you are comfortable with. Aerodynamics You need more downforce if you plan to get ahead of your opponents when they slow down for a turn. Tune for less if you prefer to overtake on the straight stretches and play it safe while cornering. Pursuit vehicles usually benefit from higher downforce as they need to stop quickly. Tires This one shouldn't be hard to figure out. Tire choice is easy for most tracks as they are mostly wet or dry, except for Aquatica which has generous helpings of both. NFS 3 is no smash and run game. You will have to put those grey cells to good use to win. Compare your times with track and lap records. Analyse replays to see what you did right and where you went wrong. Switch to your opponents view to see how AI finds its way round the track. Finally, read the manuals supplied on the CD. They may give you the info you need or draw attention to an option you've overlooked. Ever noticed that traffic drives on the left hand side of the road on mirrored tracks? Hot Pursuit Forward direction has very aggressive cops but sparse traffic. Backwards direction has more traffic but mediocre law enforcement. The El Niño is a particularly difficult car to drive, especially in Hot Pursuit mode, but it has one saving grace. The car manages to keep it's rubber side down even after major crashes. Using the handbrake in addition to the regular brake will cause your car to slow down very quickly, though wheel locking may have you facing the way you came. However, when you are racing with automatic transmission, handbraking and pressing down on the accelerator after reversing will actually reduce your braking. Use the accelerator alone to get back to racing as quickly as posible. The sound of the waterfalls comes on the wrong side of the track when playing Redrock Ridge backwards. Don't forget to check out the colonised moon in Empire City. In an ideal world, games would be free from bugs, but this is the real world and even this superb game isn't free from them. If you and your opponent are arrested in the same place at the same time, the game will crash and your computer will have to be restarted manually. Not a nice thing to happen but luckily, it doesn't happen often. While playing the Cop in Hometown in the forward direction, if you push an opponent into the front end of the park at mainstreet, he will immediately teleport to the other side while you will have to drive around it. While playing with the Best Line assist turned on, the game exits after I hit a certain number of cones. Weird but true. A minor grouse with the sound: In 2 channel stereo mode, there is no perceivable difference between the sound of the car in front of you and the one behind you, so you can't tell whether you're catching up or being overtaken. This is surprising, since older games like Roadrash (which is from the same company) have very good 3D audio positioning. 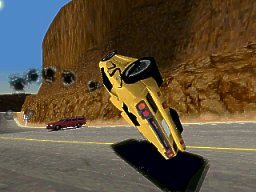 Roadrash also gives you the facility to control the volume for different kinds of sound effects, a feature that NFS3 sorely needs. The Electronic Registration feature doesn't work. This must be the developers way of thanking you for paying to get a legal copy of the game. Here, you will find tips, extra cars and a playable demo of the game. However, I have never managed a successful download from this site unless I use a Download Manager, 'else I get an error message around the 80% mark . Google gives you a plethora of sites that promise you extra tracks, cars and other goodies though www.nfscars.net is the only site I have managed to connect to. You'll find a mouth watering collection of vehicles parked here, including a Harley Davidson Trike and the Holy Grail of motor racing, the McLaren F1. If these weren't enough, you also have a program called NFS Mode which changes the night skyline to some very interesting backgrounds. Very cool, but it makes night driving much easier. Do you think you're a real mean hombre because you've become Most Wanted on all tracks running away from a Pursuit Corvette in your Diablo? Let's tweak the game a wee bit to see how good you really are, shall we? Be warned, you are using these tips at your own risk. No guarantees, express or implied. Open your NFS game folder (on your hard disk) and follow the path \GameData\CarModel\Traffic\pursuit. Within this pursuit folder, you will find 6 folders name 0000 to 0005.
i.e. 0000 is the grey cop car that comes in Hometown and Country Woods and so on. Folder 0005 contains the Pursuit Corvette that appears in every track. Empire City takes the car that is placed in 0000. Folder 0001 contains a Pursuit Diablo. I have no idea what this is for, it doesn't seem to do anything. You can always mail me if I'm wrong. If you open each folder, you will find a file named car.viv. This is the only file you need for each car. You can replace the files in these folders with the car.viv files for the Pursuit Diablo or the Pursuit El Niño, which you will find in the Lcop and Peln folders in the CarModel folder. Actually, you can copy the files for any car into these folders and be chased by 'undercover' cops, but the Bonus Pursuit cars look really good. It's very difficult to run from these High Performance, High Downforce Super Cops, giving you a Sizzling Hot Pursuit experience. Just for fun, I downloaded a Pursuit McLaren F1 from nfscars.net and placed it in 0004 which is for Rocky Pass and Summit. 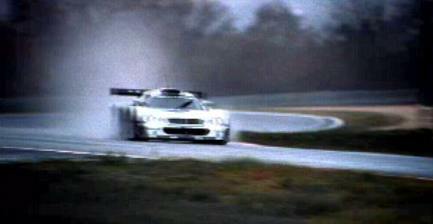 It takes a Mercedes CLK GTR to escape from that one, which comes after you like an avenging angel. Turn off Traffic and you get Raw Speed Hot Pursuit, but playing with traffic is a lot tougher. You can even replace the other Traffic vehicles viv files with game vehicles. This doesn't change the game play in any way, but it adds a bit of confusion which is fun. You're gonna say something like "How can you race a Merc in Hot Pursuit mode"? You have to download a program called Viv Wizard (837 kb) for NFS3 from nfscars.net. - Change the serial number of the car in both CARP.TXT and the FEDATA files. The serial number you choose should not be used by any other car in the game, 'else you will get an error. - Change the manufacturer name in the Data section of the FEDATA files. Eg. For the Mercedes CLK GTR, the manufacturer name will be listed as Mercedes. Change this field to any name you like as long as it's not Ferrari. The game will not accept cars from either of these manufacturers in Hot Pursuit. The Car name can continue to have the name Mercedes in it, but the entire field cannot be identical to the car name of any other car. i.e You cannot have two cars name Mercedes CLK GTR. The name entered in this field appears in the Player or Opponent car drop down menu. 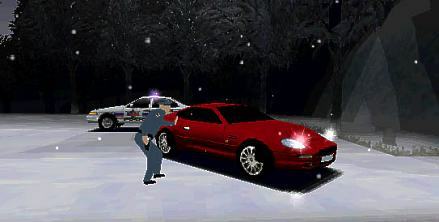 - If you tick the 'Pursuit' option in the General section of FEDATA, you can use the car as a Pursuit car to become Top Cop. - Modifications to FEDATA files should be done for all languages. If you're too lazy to change all the files, delete the language files you don't want. So, what else can you do by altering viv files? Well, you can race with the traffic vehicles. To do this, you have to create a folder(with at least 4 letters for the name) in the Car Model folder and copy the viv file of any traffic vehicle into this new folder. Note : Traffic vehicles do not have FEDATA files, without which you do not have class and other definitions. You will have to use Viv Wizard to import an FEDATA file from one of the regular cars and change it's details. Don't forget the serial number! If you're bored chasing speeders with High Performance Pursuit Vehicles, switch to a Low Performance one. Use the Range Rover to hunt down law breakers. It's fun! Cool Stuff To Download - I downloaded these from nfscars.net but they are likely to be available on other sites as well. Use Google for something useful. This program changes the Night Skyline for NFS 3. Very cool, but makes night driving very easy. The purist will disapprove. This isn't actually a car, it's a Girl riding a 3 Wheeled Harley! Available in Nail Polish bright colours, this Lady does 0-60 in under 3 secs and easily crosses 200mph! All right, even a Ninja isn't that fast, but who cares, it's just a game. Get down on your knees, you're witnessing what God created on Sunday! The greatest sports car ever made, a motor racing miracle from the Formula One team. Top speed is in excess of 230mph and with enough Downforce to crush you, this car is worth more than a Halo and a Harp. It's time to Genuflect again! Mika Hakkinen's very own F1 hurricane with wheels, the MP4/14 is still setting the tracks on fire with DC and Kimi. The attention to detail of the NFS version is amazing, including the clearance limiting wooden plank under the car and the pit lane speed limit indicator as a brake lamp. There ya have it. All the tips, tricks and hints you need to know to conquer the road. Time to unleash that Speed Demon. Now buckle up and go burn some rubber. Class dismissed.